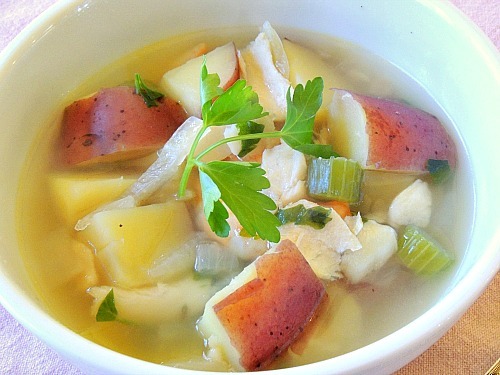 This beautiful, low fat fish soup recipe is great to include on your basic low glycemic, lifetime fat loss menu every single week! First of all it's a super easy way to eat fish regularly and fish helps you to burn fat and is full of essential fatty acids... the good fats. The other great thing is you can make it ahead on the weekend or in the afternoon and it tastes better by the time you serve it because the flavors have had time to settle and blend. In fact, how about tonight's dinner? The Super Bowl will soon be over and you have to think about putting together a quick and easy dinner. What about something simple you can get started before the game's over that's low fat, won't raise your blood sugar and super nutritious? After all you may have been indulging in some high glycemic snacks ie junk food this afternoon. A healthy, low fat, meal in a bowl that won't raise your blood sugar but will still satisfy picky eaters could be the perfect comfort food! It's true you need to do a little pre-planning for fish but sending somebody out to a fish market is worth the extra effort. All the other ingredients you probably have on hand.